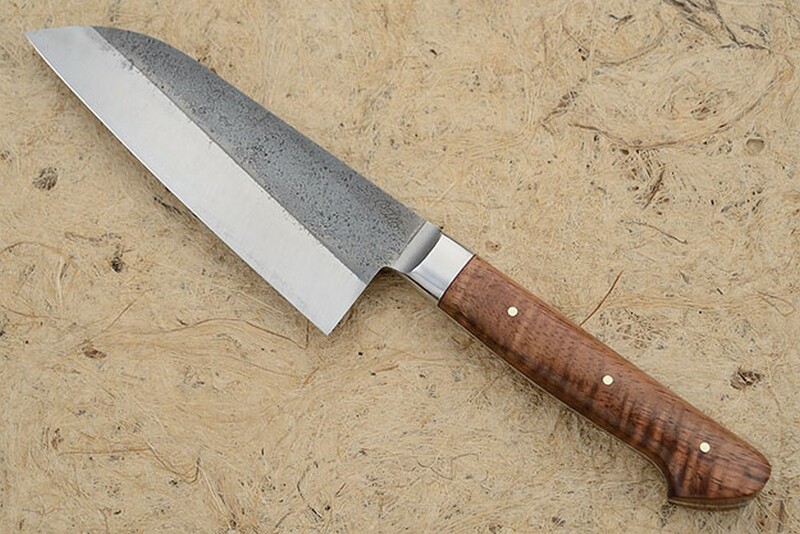 This high performance chef's knife is a perfect choice as a primary knife in the kitchen. 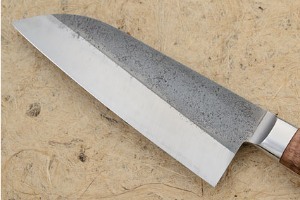 The santoku is the traditional Japanese chef's knife. This comfortable design is a fantastic multipurpose chopper. The santoku has quickly become the new favorite for chefs in the West. The gentle arch of the cutting edge is perfect for a rocking chopping motion with plenty of finger clearance over a cutting board. 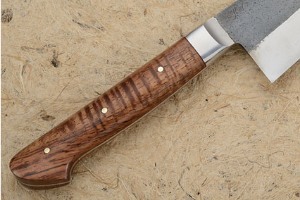 Like his hunting knives, this utility knife was pre-tested for edge flex and cutting ability before assembly. The heat treatment followed the formulas developed Bill Burke in conjunction with Mastersmith Ed Fowler and creates some of the sharpest and most long lasting edges found anywhere. A differential heat treatment results in a soft, supportive spine and an extremely hard, long lasting edge. 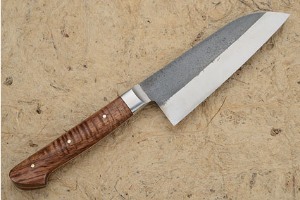 Showing his skill at the forge, the top half of the knife is forge finished. This technique also imparts some oxidation resistance and resists foods sticking to the knife. 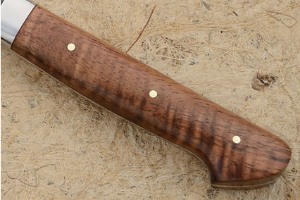 The handle is formed from presentation grade curly koa set on a distal tapered full tang. 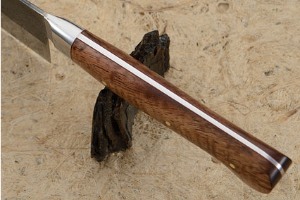 The wood has a dramatic, fine curl with a chatoyant effect that results in a changing pattern when turned in the light. The stabilized wood holds up well to the heavy demands of either a home or commercial kitchen. It is nicely carved to swell at the palm, move into a slimmer waist and finally to swell again at the beak at the end of the handle. 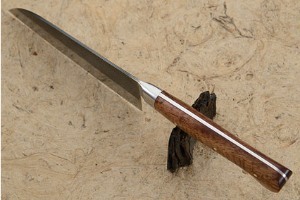 The knife has perfect balance and this ensures it is as much of a joy to use as it is to look at!